Are your kids as excited as mine to see the movie Rio that is about to be released in theaters? Here's your chance to attend an advance screening of the movie at the new state of the art ETX (Enhanced Theatre Experience) auditorium at the Block in Orange County TOMORROW. It's going to be a super family oriented screening and sure to be tons of fun. Please note that this is definitely a first come first serve opportunity but go here and enter code MOMSDAN1 to to get your chance for screening passes for Saturday April 9, 2011. 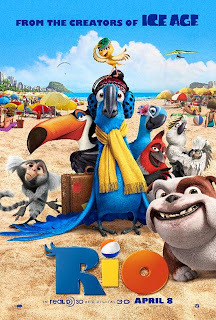 Rio will be in theaters on April 15th. Still can't get enough of Rio? Love Angry Birds? Download the Angry Birds Rio App here. And check out this Angry Birds infested video promo below.